Logan-Provo indie pop band Kitfox serve "something special" with To Keep You Company. Saturday, Feb. 20, 7 p.m. The kit fox might sound like some kind of cute, endearing little animal, but it's an endangered species of fox native to the Southwestern United States. 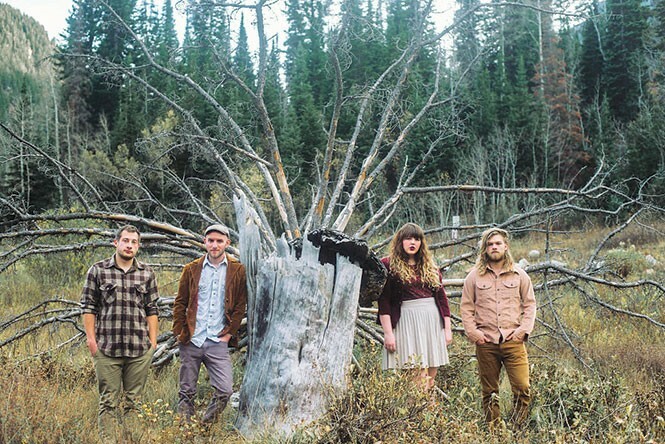 The Logan-Provo band Kitfox took its name after the creature, and it's a symbol for them. Singer-guitarist Emilee Holgate, who grew up in Logan, explains that on warm summer nights, she and her cousins would go looking for kit foxes and "chase 'em around." To her, the name of the band "is reminiscent of my childhood, and I think it's fitting to our type of music because we strive to write very moody music, and nostalgia is one of my favorite emotions to try and capture." The kind of melodic pop music indigenous to Los Angeles might sometimes appear endangered, but Kitfox has adapted it to a new habitat—Utah County. They are able to blend in with the indie folk scene that's the big thing in Utah County and most elsewhere right now, but they also set themselves apart, by design. Holgate describes their sound as "ambient-folk-space-pop," but you could perhaps just call it ethereal pop; centered around her winging, wafting voice, with underlying instrumental textures. "I always considered myself a folk artist," Holgate confesses, "but had a weird realization while we were recording that our sound wasn't really folk any more." They recorded half of their debut full-length album, To Keep You Company (self-released), in Nashville, and that's another story of adapting to unlikely circumstances. Like most of us, they went through a run of embarrassing musical infatuations—influences like Dashboard Confessional, Jimmy Eat World and Death Cab for Cutie—whose emo excesses the band discarded, while keeping the intimacy of the confessional mode. More recently, they turned to indie rock bands like Paper Kites and Kopecky, and the latter gave them the notion to head to Music City. In 2014, all the members of Kitfox were living on the East Coast, and they saw Kopecky perform live. Bassist-singer Conor Flynn recalls, "After that performance, I found out the lead singer, Gabe Simon, also did some producing, so I got this crazy idea that our band's next album could be produced by him." As poor college students, they figured they couldn't come up with the $20,000 it would cost to record the album in Nashville, so they decided to try for half that on a Kickstarter campaign, and they reached their goal, recording half the album in Utah. Adapting to their dream studio setup wasn't too difficult, Flynn notes. "The biggest difference was how fast the producer and sound engineer worked. Luckily, we really loved the vision that the producers had for our songs, so we only disagreed with where they wanted to take the songs a couple of times." The results, in songs like "Nightfall" and "Ghost," bridge the gap between the ethereal and a rock idiom, and add a greater depth to their sound. Holgate says that, as they wrote the album and prepared for the release shows, they considered what Kitfox wanted to say with To Keep You Company, and "what we want our contribution to the world to mean." In doing so, they resolved their mission to "write and perform real, raw and emotional music. It's not about creating a facade, or looking like a rock star, or writing a song that everyone wants to dance to." Flynn says Kitfox has something special in store for those who attend the release show this Saturday at Kilby Court. The band plans to provide the audience with the lyrics to the songs "so they can really understand the vocals and sing along if they would like. We also want to make the experience interactive in other ways, so we have something special planned that is a secret until the night of the show." Hmm ... Could it be actual kit foxes?